Deconstructed Computer Case (?) Mod | OhGizmo! 10 Old Computer Ads – Is There Anything More Depressing? If you’re as much of an Iron Chef fan as I am, you’ll be familiar with the term deconstructed. Like, a how deconstructed caesar salad would involve serving all of the components of a mixed salad separately. 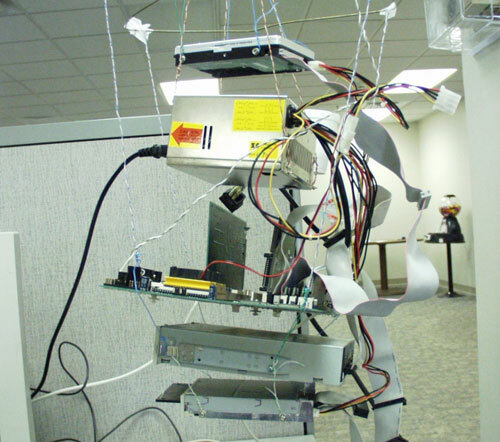 A self-professed “bored tech support guy” made himself this deconstructed computer by suspending all of the components of a desktop in midair via cat5 cables and a couple of hangers. It’s fully functional and offers a number of advantages, including easy hardware upgrading, a tiny footprint, and spectacular ventilation. Not recommended for people who have small children or pet squirrels. Hah! That is too funny.